Ann and Maria have decided to look at the deeper meaning behind all that we’ve been experiencing in the world today. Since 2008 there’s been a massive shift in people’s financial state, security and how they are viewing life, work and relationships. In this segment, we asked Master Feng Shui expert and Astrologer, Donna Collins, to give us a different take on what’s transpired. Nothing is ever as it seems…Donna will shares with us some valuable insights that will help you adjust your perception and way of thinking about your own situation. Perhaps you’ll even find the comfort and reassurance you’ve been looking for! It’s time for you to find your peace and happiness again. This is going to be a spectacular new beginning for us. We hope that this special show will help everybody find inner peace a better deal with today’s economic, family, and world issues. Donna Collins is CEO of The Everyday Feng Shui Company and Master Instructor with the Mastery Academy of Chinese Metaphysics. With degrees in Studio Art, Art History and Religion, studies with the Dalai Lama, The Ramtha School of Enlightenment and certification in HeartMath and EFT, Collins has created a worldview which has given rise to a life of great adventure. An internationally recognized artist with art in the collections of Caroline Myss, Deepak Chopra, Louise Hay, John Hawkes, His Holiness Karma Kuchen Rinpoche and the Saudi Arabian Royal Family. She is a passionate jewelry designer, a celebrity raw food chef, the founder of The Global Peace Project, and the co-author of “A Healthier You” with Deepak Chopra. Her latest book is The Imagination Muscle: Exercising Your Greatest Strength. Collins has dedicated her life to helping people live more creative lives; her reach extends across the globe and including such clients as the Neiman Marcus, Escada, Merrill Lynch, Southwest Airlines, and Toni and Guy. Get your copy of “Healing The Corporate World” by best selling author Maria Gamb! Tune in LIVE every Tuesday at 10am PST or 1pm EST to the Bella Petite Hour on America’s Web Radio. This week join Ann and Maria, so you can drive your career and happiness to the next level! Along with with Master Feng Shui Expert and Astrologist Donna Collins. PODCAST NOW PLAYING! If you miss the live broadcast of the show the podcast is available here on Bella Petite and itunes. Here is the link to a complete listing of the Bella Petite Hour radio shows on BellaPetite. BELLA PETITE HOUR PODCAST NOW PLAYING! We love Red Carpet Fever at eDressMe.com Get gowns inspired by your favorite Hollywood celebrities ! 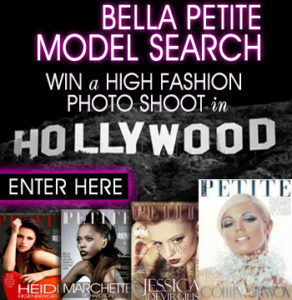 Enter the BellaPetite .com Cover Girland editorial model search! You must subscribe to enter the model search FREE. Bella Petite Magazine is Fashion, Entertainment and LifeStyle for Women 5’5″ Tall & under. Petite is fit and full figured. The Bella Petite Magazine preview issue is coming soon!